Everything is just fine. WEIRD. by Mir on January 6, 2014 in Growing, It's not a regret, it's an "experience"
School started up again today, and this morning was pretty much a study in the different personality types in our household. Monkey bounced his way through the morning, communing with the dogs acting like today was no big deal at all, like he wasn’t just heading off to high school for the first time or anything. Otto ate his cereal and read the news and observed his family spinning around him as if it’s still somewhat confusing to him, how he ended up surrounded by all of us. In other words, it was a perfectly normal morning except then both kids went to school and Monkey was amazing and I am kind of a mess (a hopeful mess, you understand) so we are not going to talk about that. Instead, let’s go back to that whole vision board thing, because a few of you asked to see my board. I have to say, every single year I am amazed at how much I love doing this and then how often I find myself looking at my board once I hang it in my office. I don’t think there’s anything earth-shattering in there, but I like it. See the element in common…? Such a good reminder to both of us, as ladies who are prone to excessive amounts of pesky FEELINGS. And would you believe that I JUST NOW realized that we put them on almost exactly the same spots on our boards, too? That was unintentional. And a little freaky. Bring it on, 2014. I think we’re all ready. Spotting the common element was easy because it’s what I immediately spotted on your board! It’s something I am, um, often aware of. In fact, when I’m stressing out about not being able to find my Big Girl Pants, I usually find I was wearing them all along. I love zero grams of meh. 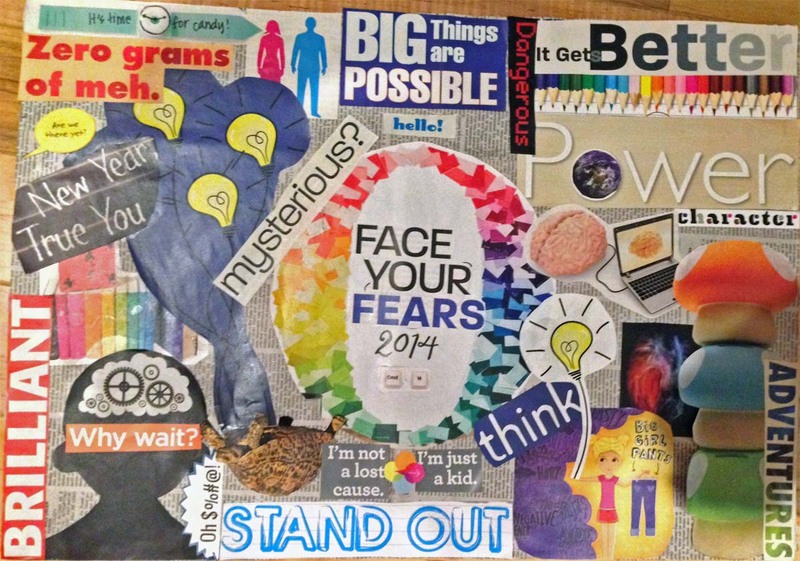 These vision boards are awesome. Wearing big girl pants is all very well but, at my advanced age, they’re a little torn and a little faded (and I’m a little worn and a little jaded). I think I’m going to have your vision boards printed on material and then make pants out of them! Stunning works of art and ambition. May 2014 be all you hope for and Monkey’s school gig go well and Chickadee follows the ideas on her board-she’s got a lot of good going there. Hey Otto, happy happy to you too. Love Chickies board!!! Hope you give an update on how Monkey’s day went…were you biting your nails until they got home?? Happy 2014. Oh my god, Chickie’s board actually made me cry. I resonate with so many things she’s put there! Except I’m not a kid anymore, but it seems to fit anyway. 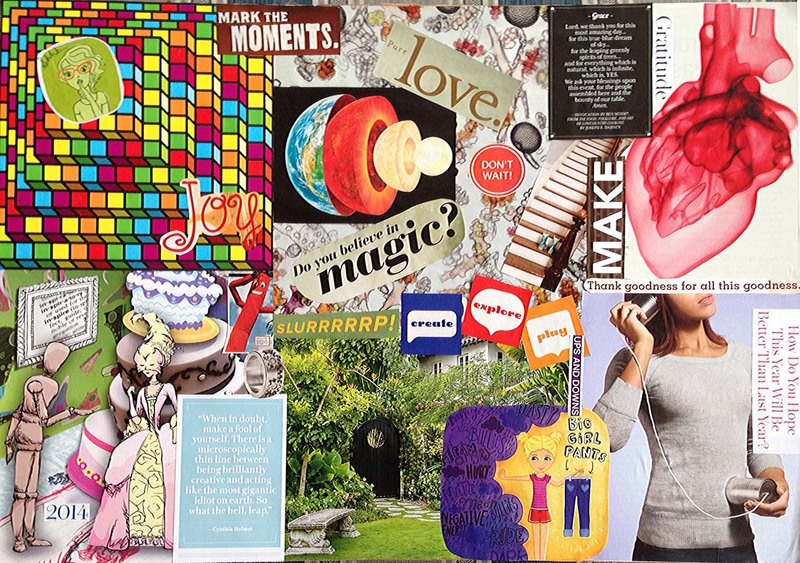 Vision boards are one of those things were I’m like “would that be cheesy (for me) or helpful?” Seeing yours pushes me towards the helpful side. I love these, both of them, and think it’s awesome that you have the matching element and placed it in the same spot. Fingers crossed for wearing of the big girl pants and lots of love in your year. Y’know, I was going to make an inspiration board for NaNoWriMo but ended up not doing it –I was inspired anyway and I finished, so NBD. But I love the idea of doing a vision board and thank you for reminding me. I forgot to pack my big girl pants for San Diego, but when I get back to Washington I’m going to make me one. What do you use for the backing — is it poster board? Poster board would probably work… we usually cut up some Amazon boxes. Recycling! I love on Chickie’s ….I’m not a lost cause, I’m just a kid! I simply love that and would use it myself but I’m not a kid. :( And on yours…I love Do you believe in Magic? Reminded me immediately of Shawn Cassidy’s song back in the 70’s. Yes, I am that old! ;) Happy New Year, Mir and fam!! !